Milk thickened with rice flour and flavoured with cardamom, saffron and fresh Banana. A delectable and fragrant milk and rice based Indian dessert. An exclusive recipe of dessert inducing happiness in you, one spoon at a time. 1.Combine flour, butter and sugar in a food processor. Process until mixture resembles fine breadcrumbs. 2.Add yolk and chilled water. Process until dough just comes together. 3.Turn pastry onto a lightly floured surface. Knead until just smooth. Shape into a disc. Wrap in baking paper and refrigerate for 30 minutes. 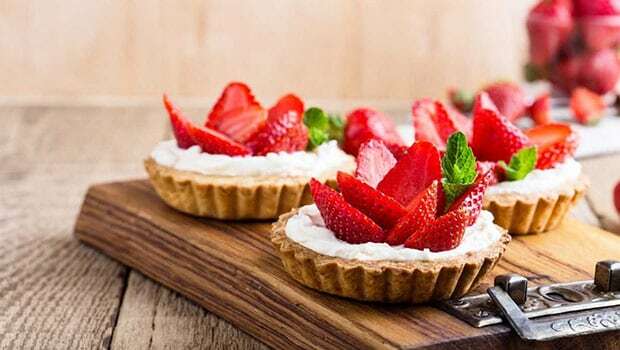 4.Remove from refrigerator, roll and place into tart shells. Line pastry case with baking paper. Fill with ceramic pie weights or uncooked rice. 5.Bake at 180 C for 10 minutes. Remove weights and paper. Bake for another 5 to 10 minutes or until pastry is golden. Allow to cool. Avery easy and simple recipe !